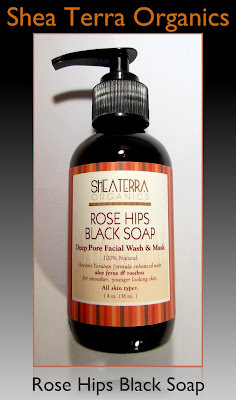 Shea Terra Organics is a "new to me" natural and organic skin care company, and today I have a review of their Rose Hips Black Soap Deep Pore Face Wash & Mask. This product comes in a 4 oz. glass bottle with a pump-style dispenser. It's a very thick liquid with the consistency and looks of molasses, only without the stickiness! Deionized water, Yoruban black soap (cocoa pod ash, plaintain peel ash, palm kernel oil, camwood bark), certified organic shea butter, certified organic coconut oil, potassium hydroxide (electrocuted salts- what makes oil into soap), certified organic rose hips oil, rose hips fruit, aloe ferox, rooibos tea, kigellia africana, certified organic marshmallow root, licorice root. 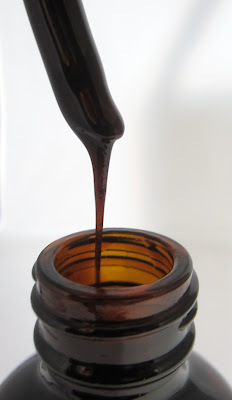 This is Shea Terra's web site description for the face wash/mask: This product is 100% natural and this wash works like microdermabrasion to get rid of dead skin, even skin tone, firm skin and fight acne. Look younger in just minutes of using. You can use it two ways, as a facial wash or as a mask. As a wash, I simply squirt about 2 pumps into my hands, wash my face using circular motions, and then rinse it off. As a mask, I apply 2-3 pumps on dry skin (you may notice a little tingling on dry skin), work it in, again using circular motions, and then rinse after letting it sit for about 10 minutes. Both options will exfoliate your skin and remove dead skin. You can actually see tiny particles after you've worked it into your skin, which I assume are dead skin flakes. Eww! But that tells me that it's working, and I have noticed that my pores are clearer. This soap rinses clean and leaves my face feeling smooth and fresh. It does seem to add a little glow and vibrancy as well. I'm using this daily as my facial wash, and then once a week, I use it as a mask. I am pleased with the results, and my skin looks and feels healthy and soft. The reduction in pore size is noticeable to me--they haven't disappeared, but they do appear smaller. I wouldn't say that I look younger in just minutes of using, but I did do a test using this product on one hand for a week. Each night before I went to bed, I washed the back of one hand with the Rose Hips Black Soap, let it sit for about 5 minutes, then rinsed it off. When I compared it to the other hand, I saw an obvious difference. Smoother skin, less fine lines, and softer skin were all evident on that hand. I looked at my hands each morning, and my "test" hand still showed those results, although less evident than immediately after using the product. My thought is that any improvement is good when it comes to reducing wrinkles and the effects of aging! Shea Terra Organics are available on their web site, as well as Amazon and many other eTailers. I signed up for their mailing list, which often yields 30% off discounts. They carry a wide assortment of products in yummy scents and concoctions for the face, bath and body care, hair care, hand and foot products, and more. Their mission is to preserve Africa's wildlife habitats while helping indigenous individuals to find ways to sustain themselves without aid. *Product featured was furnished by the manufacturer or PR firm for review. I received a bottle of this in one of my Eco.Emi Boxes and absolutely love it! Sounds like a good facial wash & mask. Anything to make us younger sounds good to me. Thanks for a great review, I will look it up--anything to help me fight my 40's LOL. African Black soap is good stuff--it's also great for eczema--I bought some probably 8 yrs ago for my son, nice to see it gaining popularity!